Kimber has been updating us regularly since her original Lymph Node Transfers last year in New York. Kimber has Primary Lymphedema in her legs and has lived with this since a child. The lymph nodes in Kimber’s entire body have been mapped by the use of a specialist MRI and are normal in the upper body but the nodes are missing in her legs. It is very important with Primary LE that these test are done so that nodes are not removed from an area that is short of nodes. Therefore only surgeons who have access to these tests should perform this surgery on someone with Primary LE.. This will be Kimber’s 3rd LNT.. Below is Kimber’s latest update before she heads of to New York for surgery..
“It’s been over a year since my last update from having two LNT’s back in September 2013 with Dr. Becker and Dr. Vasile in NYC. A couple of positive and interesting things have taken place since those surgeries. The most positive is that I’ve had no hospitalizations due to those God awful staph/cellulitis infections. I should have been in the hospital six or seven times by now. I can’t even begin to tell you how life changing this has been. The benefit of me not living in and out of the hospital and not just for me but for my husband and our three kids as well…kids have their mother, husband gets his wife, and I finally get myself. Not only have I managed to avoid the hospital but I was also able to start working part-time. I haven’t been able to work in over sixteen years because of having chronic infections pausing my life and those around me. After I complete the next two LNT’s that are needed, my next goal will be to eventually transition to working full-time. Another positive aspect, although a minor one, is that I am able to ski again. I had to stop skiing about twelve years ago due to the LE as it truly had taken over my legs. Along with all the extreme swelling they also felt like tree trunks and I couldn’t fit into my ski boots no matter how hard I tried. Skiing last winter with my family felt so exhilarating that at one point when I reached the bottom of the mountain tears streamed down my face. I truly couldn’t believe I was able to do this with my family. I also noticed this past summer it was a little easier with the heat. My legs are definitely still swollen but I was surprised how they responded better as long as I was wearing my compression stockings. I will never be able to go with out compression but the legs didn’t get as large in the heat and humidity like they have in the past. The interesting aspect during all of this was having to switch surgeons. Unfortunately, Dr. Becker no longer has her license to practice medicine in the United States. Not because of her own doing but the laws are completely different in the U.S. and Europe. From what I understand, when she went to reapply for her medical license wasn’t approved. It was upsetting and shocking how things turned out and took place. However, because of Helen and the wonderful women who I’ve met through her that are near and dear to my heart (you know who you are), they helped me to keep my head up and to remain focused on the goal. These women gave me wonderful advice and encouraged me to set up an appointment with two surgeons who also perform LNTs. Dr. Smith and Dr. Dayan are top surgeons in their field, come from respective hospitals in NYC, and they’re both extremely involved with LE and LNT’s. I can’t thank Helen and our friends enough. When I thought all hope was lost they stood beside me and lifted my spirits and helped me move forward so that I could continue my quest for better health as I still needed two more LNT’s. I’m about to have my third LNT this Monday, December 15th, in NYC with Dr. Mark Smith. I’m having lymph nodes removed from the neck and transplanted to below my right knee. He’s also going to try to “clean up” the top of my right thigh from botched surgeries that I had when I was a teenager. So, tomorrow I leave for NYC and surgery on Monday morning and be a temporary resident for three weeks before I’m able to return home 🙂 Just like last year, I’m a BUNDLE of nerves and will be happy when it’s over. I know I’m in extremely good hands with Dr. Smith and believe things will turn out very well. Precautions to lower the risk of Lymphedema after cancer treatment. During surgery for various cancers Lymph nodes may be removed and radiation given. This leaves the effected limb at risk of Lymphedema. Myself I have one leg with Lymphedema and one at risk, as Lymph nodes were removed on both sides followed by radiation. I therefore treat the at risk limb with great “respect” to protect it from Lymphedema. Once Lymphedema starts that is it, there is no going back, so if there is a way to stop it starting I encourage you to use it!! I thought this article from the American Cancer Society gave very good advice, a great deal of which is important for limbs which are at risk or which have Lymphedema…taking these precautions may also stop your Lymphedema worsening. At this time there are no scientific studies to show that lymphedema can be prevented. Still, most experts say following these basic steps might lower your risk of lymphedema, delay its onset, or reduce its impact. Regular check-ups should include screening for lymphedema. If you’ve been recording measurements of the affected part of your body, this may be part of the check-up. Talk to your health care team about how often you should be checked. After surgery and/or radiation, you will learn how the affected part of your body normally feels. Any changes in size, color, temperature, feeling, or skin condition should be reported to your doctor right away. Try to get to and/or stay at a healthy weight. We know that obese people are at higher risk for lymphedema. Talk to your health care team about what a healthy weight is for you, and get their advice on how to get to or stay at that weight. It’s important to use the part of your body that’s been affected by cancer for normal, everyday activities to help you heal properly and regain strength. Using your muscles also helps the lymph fluid drain like it should. Certain types of exercise can reduce your lymphedema risk, too, and some exercises can make lymphedema better after it starts. If you’ve had surgery or radiation treatment, ask your doctor or nurse when you can start to exercise and what type of exercises you can do. Avoiding exercise and allowing your body to get out of shape may lead to lymphedema and episodes of swelling that are sometimes called flare-ups. But keep in mind that some kinds of exercise can increase your risk of lymphedema or make lymphedema worse if you already have it. Overuse, which can result in injury, has also been linked with the start of lymphedema in some people. Work with a well-trained fitness or health professional to design a program that’s right for you and starts at a low level of intensity and progresses slowly to avoid overuse. • Use your affected body part as normally as you can. Once you are fully healed, about 4 to 6 weeks after surgery or radiation treatment, you can begin to go back to the activities you did before your surgery. But check with your doctor first. • Exercise regularly, but try not to over-tire yourself. Before starting any exercises, talk with your doctor, nurse, or physical therapist. They can help you set goals and limits so that you can work at the level of activity that’s right for you. • If the affected part of your body starts to ache or swell, lie down and raise it above the level of your heart. • Avoid repetitive overuse of the affected body part. Sudden increases in how long or hard you work out might trigger or worsen lymphedema. • Any exercise program should be started gradually, increased cautiously, and stopped if you have pain, more swelling, or other discomfort. Talk with your doctor if you have any of these problems. If they continue, ask about being referred to a lymphedema specialist. Compression garments are fitted sleeves or stockings that can help control lymphedema. They can help prevent and reduce swelling by moving lymph fluid from the arm or leg back into the body. Careful fitting is needed and you should follow your health care professional’s advice on use and care of the garment. Compression garments are most often used by people who already have lymphedema. But if you are at risk for lymphedema, you might want to use one to lower your risk in certain high-risk situations. For instance, lymphedema has been linked with air travel, possibly because of air pressure changes. But there are pros and cons to using a compression garment on long or frequent flights. Ask your doctor or therapist if you should be fitted for a garment to wear during air travel. Do not use a poorly-fitting compression garment under any circumstances, as this may increase risk for lymphedema or make it worse if you already have lymphedema. You usually do not need a compression garment to prevent lymphedema during exercise. But if you’ve noticed swelling while exercising, talk to your doctor or therapist. Try to avoid infections, burns, and injuries. Your body responds to infection, burn, or injury by sending extra fluid and white blood cells to the area. If lymph nodes and vessels are missing or damaged, it’s harder for your body to move this extra fluid, which can trigger or worsen lymphedema. • Keep the affected area clean. Careful skin care can help you prevent infections. • Keep your hands, feet, and cuticles soft and moist by regularly using moisturizing lotion or cream. This will help keep your skin from chapping or cracking. Push your cuticles back with a cuticle stick while they are soft (after a bath) rather than cutting them with scissors. Try not to pick at or bite your cuticles. • Watch for early signs of infection, like pus coming from a cut or scrape, rash, red blotches or streaks, swelling, increased heat, tenderness, chills, or fever. Call your doctor right away if you think you have an infection. • Be extra careful when shaving, and use a clean razor on clean skin. • Use an insect repellent to avoid bug bites when outdoors. If a bee stings you in the affected area, clean and raise the limb, put ice on the sting, and call your doctor if there are signs of infection (see above). • Avoid activities that irritate or chap your skin. is labeled SPF 30 or higher, and try to stay out of the sun between 10 a.m. and 4 p.m.
• Your affected limb might not sense hot or cold as well as it did in the past. Test bath water temperatures with an unaffected limb. • Avoid extreme temperature changes, such as heat from hot tubs and saunas. If you use a heating pad or ice pack on the affected area, limit the length of time you use it until you know how your body will respond. Both heat and cold can damage tissues and can increase fluid build-up. Some doctors may advise you to stay away from all sources of extreme temperatures. • Protect yourself against falls, fractured bones, and serious burns. Cellulitis is an infection in the tissues just under your skin. Signs of this problem include redness, warmth, fever, pain, and flu-like symptoms. Report this urgent medical problem to your doctor right away. See the section “Take care of yourself” for ways to help prevent infection. Cellulitis can lead to or worsen lymphedema. In fact, if it becomes a repeated problem, suppressive antibiotics may be used to keep it under control. • Whenever possible, have your blood drawn, IVs, and shots given in your unaffected arm. Get flu shots and vaccinations in your unaffected arm or somewhere else. Let all your health care providers know that you are at risk for lymphedema. • Wear protective gloves with sleeves when doing household chores using harsh chemical cleansers or steel wool, when gardening or doing yard work, and when working with animals that could scratch or bite. • Wear a thimble when sewing to cut down on needle and pin pricks. • Use oven mitts that cover your arms instead of hot pads. Be careful when frying foods, boiling liquids, and removing food from a microwave oven. • Keep pets’ claws trimmed to avoid getting scratched. • Always wear well-fitting, closed shoes instead of sandals or slippers. Do not go barefoot. • Keep your feet clean and dry. Wear soft protective socks (cotton or padded types). • Dry the creases between your toes after bathing. • Cut toenails straight across to help prevent ingrown toenails. Try to avoid pressure or constriction. • Wear loose jewelry, clothing, and gloves. Do not wear anything that forms a snug band around your arm or wrist. Be sure compression garments fit well and are worn properly. Clothing and compression garments should be supportive and have smooth, even compression. • Do not use shoulder straps when carrying briefcases and purses. • Wear a loose-fitting bra with padded straps that do not dig into your shoulder. • Have your blood pressure taken on the unaffected arm. If both arms are affected, blood pressure can be taken on your thigh. Or, you can ask that blood pressure be measured by someone using a hand pump and stethoscope rather than using a machine; the machines often use high pressures for a longer time. • Avoid socks, stockings, undergarments, or pants with tight elastic bands. • Wear shoes that fit well. • Try not to stand or sit in one place for too long (more than 30 minutes). Do not cross your legs when sitting. • Most people with leg lymphedema benefit from wearing a compression stocking when up and walking around. A compression stocking can help squeeze the lymph fluid through the remaining vessels before it builds up. The stocking must be well fitted to apply the right pressure while avoiding too much tightness near the top of the stocking. Ask your doctor or physical therapist if you should be fitted for a compression stocking. When the title of this Blog Post entered your Inbox, let’s face it, your heart did not go pitter patter with excitement. Please try to stick it out!!! You will learn something and I will attempt to give you a few laughs along the way! 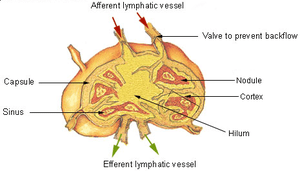 You and your Lymphatic System have something in common– misunderstood and under appreciated. 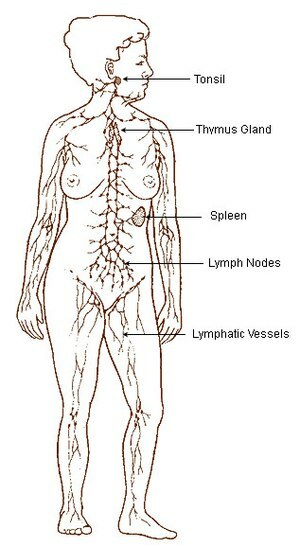 There are 500 to 700 lymph nodes in the body. Who would think if you have one or a few of those removed, in my case 14, it could cause so much trouble? This is Estherlou’s story of living with lymphedema. Thank you for sharing this intimate story of how this affects you. I started my day today with the Physio for Manual Lymph Drainage and to see how things were going. This week I had not used the Ready Wraps and had worn my compression stocking instead. I had felt that the Ready Wraps were pushing the fluid from my knee downwards instead of up and away!! I had also decided to just do the walking I needed to do this week, not strengthening exercises or stretching of the knee. This was because I am not sure if the extra exercise was causing the knee to swell rather than being Lymphoedema. We did not do any measures today but the Physio felt that I was actually getting a visible knee and less swelling. Next week we will measure again and hope to compare these to pre surgery measurements. My leg is soft and there is no pitting, so this is good, but is it due to Lymph nodes or all the treatment I am getting!!! Oh my goodness what a relief I could feel the tears coming but managed to hold it together. The technician then went and got two of the doctors to come and have a look. They thought that maybe there were two lymph nodes and asked how many had been transferred, but I did not know that, I thought it was usually only three or four to protected the donor site. They said because there was fluid present it was difficult to tell but they thought two… Well that is much better than zero…. My story continues!!!! A light at the end of the tunnel, after all that I have been through, was more than I hoped for. I emailed my doctor and told him to expect a report and I wanted to hear the results before I see him next Friday! !